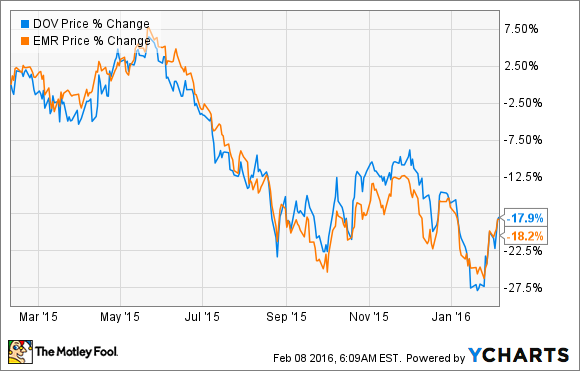 Two energy heavy industrial stocks, but which one is the better buy? Thematically, Emerson Electric (NYSE:EMR) and Dover Corporation (NYSE:DOV) have much in common. Both are industrials with heavy expsure to the oil & gas sector and dividend aristocrats with around 60 years of increasing dividends behind them. The bull case for both stocks lies within the idea that 2016 will prove to be a trough year in their underlying earnings, and that their current valuations provide compelling value for long-term investors in anticipation of a 2017 rebound. Let's take a closer look to see if this thesis has merit. At first glance Emerson Electric's 4.1% dividend yield is more attractive than Dover Corporation's 2.8% but let's look deeper into sustainability and growth prospects. The best way is to look at free-cash-flow (FCF) -- the cash left over from earnings used to pay dividends and debt. Despite facing a tough 2016 both companies are set to generate healthy FCF in 2016. Dover expects to convert 11% of 2016 sales into FCF and and Emerson Electric recently guided toward $3 billion in operating cash flow for 2016. As you can see above, both have decent dividend coverage, but Dover looks better placed. Emerson's current yield of 4.1% is more generous, but even if Dover paid the equivalent in dividend its coverage would be slightly better. Moreover, Emerson plans to spinoff its network power segment -- important because according to management it's a "good cash flow generation business." Finally, it's worth checking the numbers against historical figures as some industrials can see sharp increases in FCF during recessions (capital expenditures get cut, but then have to be increas CapEx when the recovery comes) but as you can see below the forecast 2016 numbers are above the 10 year averages (both around 11%) but not significantly so, and I would still give Dover the slight edge here. The first chart above shows both companies have been hit hard by falling energy prices. Going back to 2014 Dover generated 34.5% of its segmental earnings from its energy segment, and its fluid segment (18.8%) also has energy exposure. Meanwhile, Emerson Electric generated 44% of its fiscal 2014 segmental earnings from its energy heavy, process management segment. Emerson's latest quarterly earnings saw earnings before taxes drop 34% and with process management earnings down 31%, meanwhile Dover's earnings before taxes fell 27% and its energy segment earnings fell 70%. Both companies are exposed to the kind of industrial spending areas being hit in the current slowdown, and have seen significant declines in their order books. Emerson Electric's order book isn't much better. That said, I would prefer Emerson Electric on an end-market exposure basis. It's true that oil/energy matters less to Dover because of its fall (the energy segment was responsible for less than 14% of segment earnings in the last quarter), but Emerson Electric's CEO David Farr argues that only 25% of Emerson Electric's overall business serves the "oil and gas marketplace." Moreover, Dover's oil & gas business primarily provides upstream solutions. In other words, it's reliant on rig activity and oil production. Emerson's business has upstream exposure, but it also has downstream exposure and management spoke of "favorable" markets in U.S., Europe, and Middle East. Theoretically, downstream could benefit from low oil prices because they induce higher volumes in say, petroleum refining or chemicals. In addition, Emerson's guidance for 2016 includes expectations for modest growth in its climate technologies and commercial & residential solutions businesses, and its overall sales are expected to turn positive in the third-quarter. If you are looking for a value stock with some upside to potentially higher oil prices and stabilization in the industrial sector in 2016 then both stocks are attractive, but if forced to choose Emerson is better. Its end markets are arguably more favorable than Dover's and there isn't much difference on a dividend coverage basis. Throw in the cheaper valuation (based on the forward EV/FCF estimates in the first table) and I would take Emerson Electric over Dover Corporation.